See your contents like never before! Discover how users interact with your pages right now. Get instant feedback on where goes the attention of your users, so you can take action immediately and improve your retention. Stop waiting for your data analyst. You don't even need a separate tab or window. Get just the data you need, right on your content. 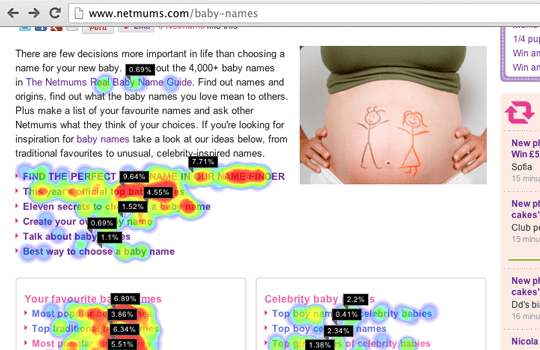 Some think heat maps are only good for usability studies with limited scope and timeframe. Our heatmap technology is different, supports dynamic elements (menus, forms, sliders), is robust to changes in layout (ads, responsive design, etc. ), and comes with no sampling. We are using heatmap for sketchappsources.com. The installation takes 1 minute, it is very easy. Now, we can see how our users navigate in real time and we can easily test a new design or a new feature and we have the ability to see the real time impact. 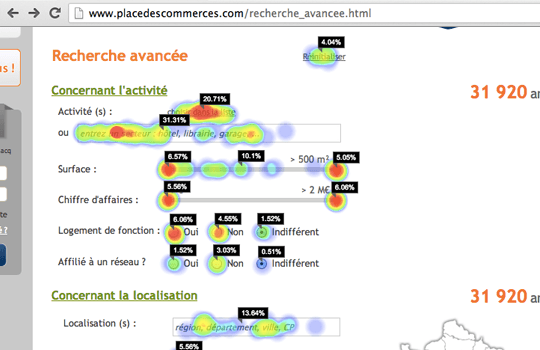 We use heatmap for our websites www.fusacq.com and www.placedescommerces.com and we are more than happy with it! The installation and the use are very easy, and you don’t need more than a glance to see the powerful results. “ I can’t do without it! Who cares about what happened yesterday when you cannot change it? Most online contents are short-lived and only real-time analytics allow you to act right on time. 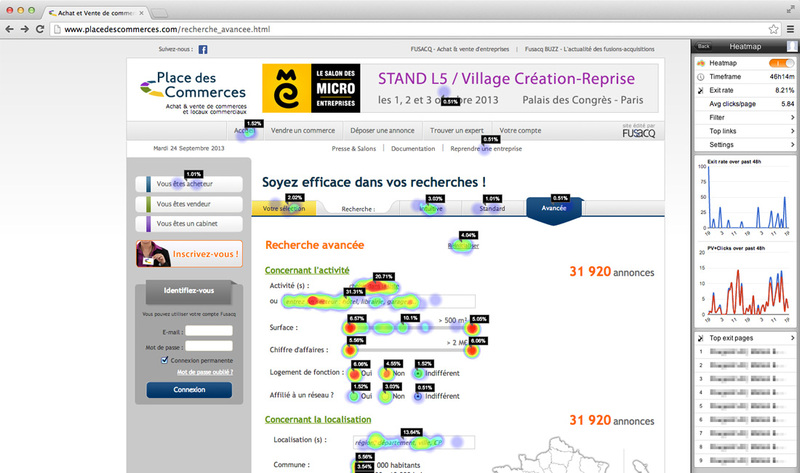 The heatmaps appear in seconds on your screen, and are constantly updated: no need to reload your page! Edit your content, change a picture, then see the impacts of your change immediately. Most analytics tools are overwhelming because they show everything they have, and argue it's "Big Data". You need analysts to dig up the info and they sometimes cannot get it because of sampling. heatmap comes with no sampling, and breaks down its Big Data to only provide the data that make sense to you, to track in realtime the performance of your site. In its "augmented reality" approach, heatmap's sidebar brings data right on your pages, with the most important data to keep you focused on what is happening on your site. Plus, the interface is 100% interactive and allows you to browse your pages even when the heatmap overlay is displayed, so you can investigate further or "replay" the navigation of your users. Our tag is very small (<8kB) and asynchronous, so it won't slow down your pages. The tag works with all browsers (even IE7! ), ajax navigation, fixed elements, etc. and handles rendering differences between users (e.g. ads, responsive design, zooming, customizable widgets), and is configurable, if need be. heatmap only collects the data needed for you to improve your content strategy. Nothing more. No key-logging. No cookie sniffing. Even IP addresses are not logged. This means we really have nothing to sell to third parties. All the collected data is anonymous, which protects your users as well as your own data. Saw something that does not seem to work? File a bug ticket or contact our support (if your plan includes it). You can also order consulting missions to train your users, help your developers tweak the tracking configuration, etc. The "Premium" plan is offered for free to students, teachers and charity organization. That's a donation worth $100/month! Test for free, as long as you want! Media and e-commerce preferred choice! All inclusive and scale up to your needs! Have you just created a dedicated page or website for a special event (Black Friday, product launch)? You cannot afford to wait even hours to know what users do. 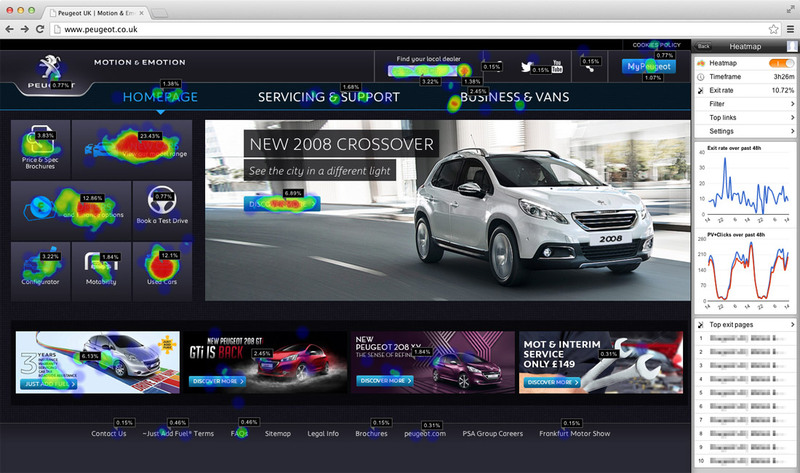 With heatmap, you get useful data in real-time, so you can act fast and immediately check the impact of your changes. Your pages are full of dynamic contents: menus, galleries, videos, etc. 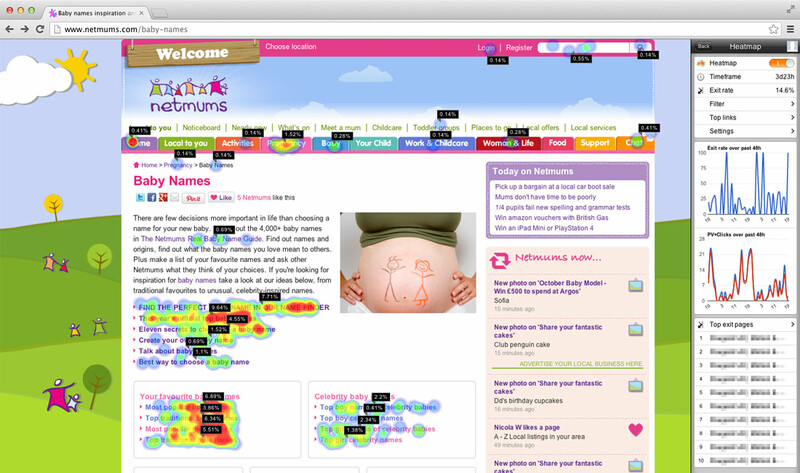 heatmap only collects the data needed for you to improve your online store. Nothing more. All the collected data is anonymous, which protects your users as well as your own data. Though, heatmap can provide data on password-protected pages, and supports HTTPS. No need to leave your website and get lost in the overwhelming interfaces of usual analytics tools. 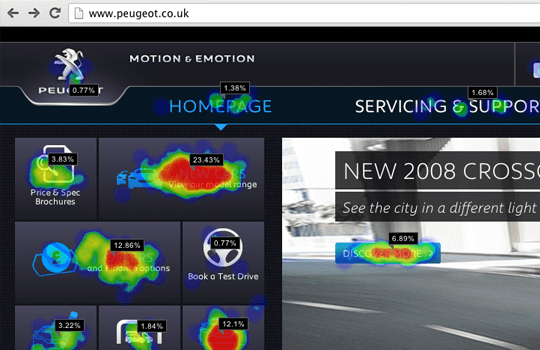 The heatmaps appear in seconds on your screen, on your site, and just browse your pages as usual. Your webapp is full of dynamic contents: menu, dropdowns, popovers, AJAX, etc. Most pages of your webapp are password-protected and/or over HTTPS. heatmap works on them without needing you to configure anything, or worse, compromise your security so screenshots can be taken. And obviously, HTTPS is supported. heatmap only collects the data needed for you to improve your webapp. Nothing more. No key-logging. No cookie sniffing. Even IP addresses are not logged. All the collected data is anonymous, which protects your users as well as your own data. User interactions are captured whatever the user's location, browser or OS. They are sent over to our servers in the cloud, and instantly displayed on your screen, right on your website.